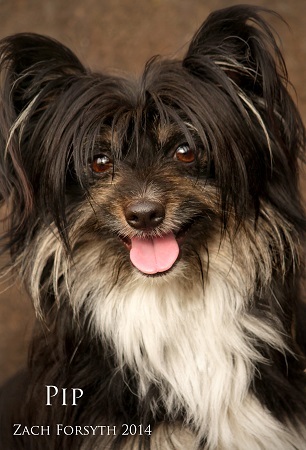 Pip the Papillon mix is here to make you smile and brighten your day! No amount of rain or clouds can diminish my sunny personality! As you can imagine, I am fabulous with all sorts of people and other animals. I’m one year old and about 10 lbs, but don’t start thinking I’m a little guy that has to be coddled all the time. It’s true I look great in sweaters and love a warm blankie, but unlike some of those other little softies I’m not afraid to get my feet wet. No really, I am a great walking buddy even in the rain! If you are looking to bond with a charismatic and humorous pooch then I am your boy! Fill out an application at pixieproject.org so we can schedule a meet and greet. I am fixed, vaccinated, microchipped and crate trained. My adoption fee is $300.